I am often amazed and humbled of what Jesus willingly put Himself through just to redeem us from sin. I know I couldn’t do it! If you have ever watched any of the Hollywood versions of Jesus’s life, when it comes time for Jesus to be arrested in the garden of Gethsemane the night before His crucifixion it’s very hard to watch. I remember the first time I saw “Jesus of Nazareth” on TV back in the 80’s when I was about 12 years old (best version ever in my opinion). I was on vacation with my dad and brother. I guess they just thought it was something good to watch during Easter week. But to me, I cried and cried until my head hurt and my eyes were bugging out of my head. My heart was completely broken to graphically see what Jesus did for me. I felt such guilt and sorrow. It was then that I truly understood how absolutely horrible of an experience Jesus went through for all of mankind, what suffering really is. Jesus had already been awake for a good 24 hours before He stood before the crowds who chose Him to die instead of Barabbas. He was a pretty tired guy. Then He was taken away to be whipped and beaten to a pulp just because that was the Roman way. I can’t image how many pints of blood He shed. But when that wasn’t enough, He was made to carry a cross through town and up a tall hill. I’m sure you can guess that the cross wasn’t made out of balsa wood. No, it was extremely heavy. Heavy like the sins of the world. 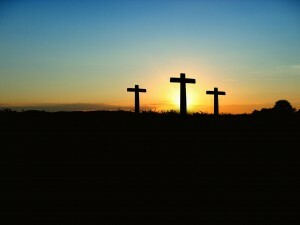 As He made His way to Golgotha, He was brutally beaten even more, losing even more blood, until He couldn’t even walk. Yet He stood up and carried on in His incredible love for us. Once He got to the top of the hill, He was nailed to His cross. These weren’t little nails like you might tack up a poster in your kid’s room. These were big, thick, square-shaped spikes. More like railroad ties. And they were driven through His hands and feet. Then the Roman soldiers stood the cross upright so Jesus’s body would hang from it. Gravity can be a bad thing. I can’t imagine the pain and suffering of our Lord that day. I just can’t wrap my human brain around it. To think that He did all that, all out of love, is certainly beyond what most people would do for each other, especially in current times. Today’s culture is all about self-preservation and self-centeredness. Even our brothers and sisters in Christ struggle to think of others first as Jesus commanded and exemplified. It just doesn’t seem to be in our DNA anymore to sacrifice and help others. But Jesus did. And here’s the icing on the cake. Even while He was hanging there struggling to breathe, bleeding more and more, feeling His internal organs swell as they filled with fluid, feeling the pain of pulling muscles…even then Jesus thought of others. He offered hope and comfort to the criminal hanging next to him and assured him that he would be with Jesus in heaven. I use my kids’ easel to regularly write Bible verses so that my boys will learn Scripture and be continually exposed to the heart of God. One thing I always include and relentlessly drive into their brains is the acronym “J-O-Y.” It stands for “Jesus-Others-You.” I even put it in numerical order of importance for them. And when you see it like this you might even notice that it spells “JOY.” Nice coincidence. If we are to always put others first, does that mean we get a free pass when we’re going through trials and tribulations, when we’re in the middle of our own suffering and pain? What if we’re battling a terminal illness? What if we’ve experienced a painful loss of a loved one? What if life just hands you a big bowl lemons through undesirable work conditions, or belligerent children, or financial struggles? Should you still think of others? Yes, and again I say, yes. Think of Jesus Himself on the cross. Remember the two criminals who were hanging next to Him that awful day? One somehow managed to still be mean and abusive. But the other asked if Jesus would take him to Heaven with Him. Did Jesus answer in disgust and say, “Are you kidding? You’re asking me that NOW? Can’t you see I’m a little busy here dying for all mankind?” No, He didn’t. Instead, He turned to the thief and simply said, “Verily I say unto you, today you will be with Me in paradise.” In the middle of the unfathomable suffering He was enduring, He forgot about Himself to show compassion and mercy to one more soul, cleansing the thief of his sin even as they both hung there. Practicing “J-O-Y” is a human thing, albeit a good one. Jesus being the Son of God already held the number one spot in that list, so He didn’t need to think about His own suffering first and foremost. All that was needed was to think of others even in those waning moments of His earthly life. And isn’t that what the cross is truly all about? Let us always remember the sacrifice of Jesus, and not just at Easter time or the week after it. Let us remember how He gave of Himself and thought of others through every moment of His life, even at the cross. And let it stand out as another example of His true love, one that inspires us to even deeper faith, greater kindness, and profound generosity. Are you suffering through something today? How can you offer comfort to others who are also in need? When we comfort each other then everyone feels better.